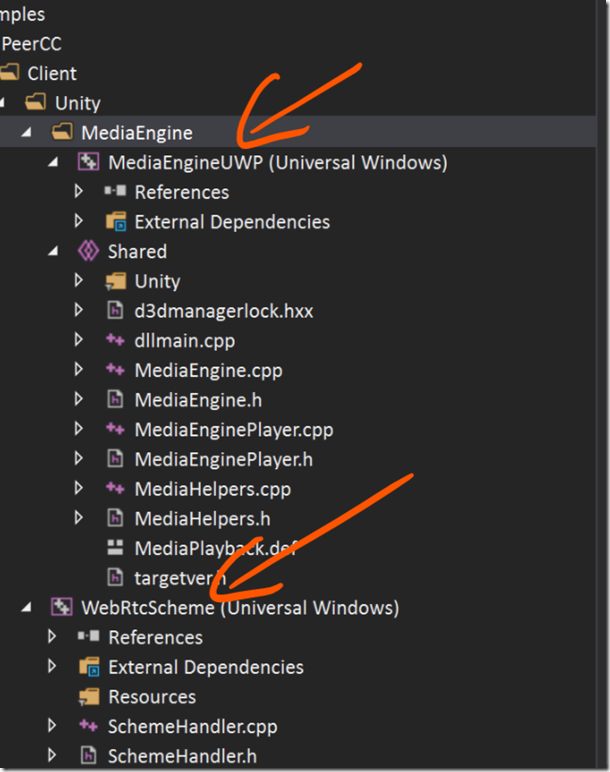 This is a follow-on from my previous post around taking small steps with webRTC and UWP. At the end of that post, I had some scrappy code which was fairly fixed in function in that it was a small UWP app which would use the UWP webRTC library to connect to a signalling service and then could begin a conversation with a peer that was also connected to the same signalling service. 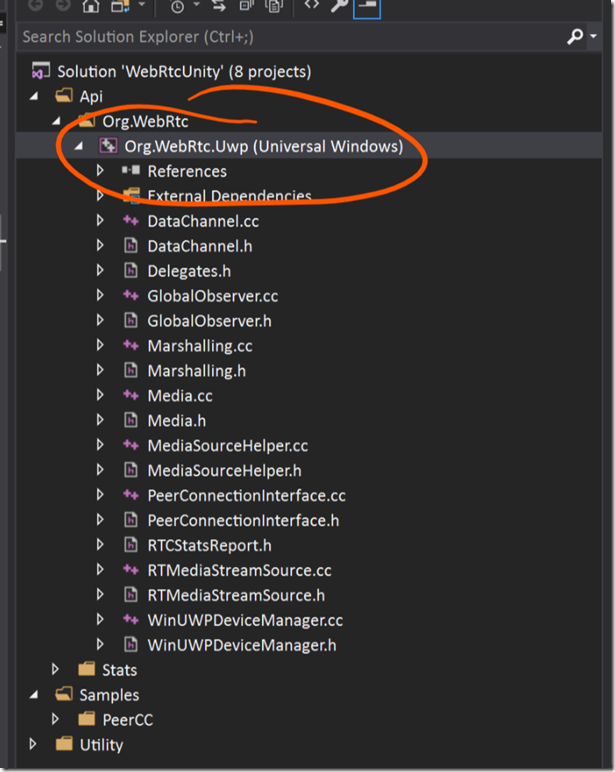 The signalling service in question had to be the one provided with the UWP webRTC bits and the easiest way to test that my app was doing something was to run it against the PeerCC sample which also ships with the UWP webRTC bits and does way more than my app does by demonstrating lots of functionality that’s present in UWP webRTC. 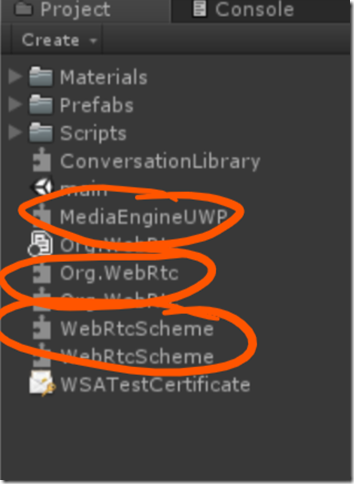 The links to all the webRTC pieces that I’m referring to are in the previous 2 posts on this topic. The code that I had in the signalling branch of this github repo at the end of the previous post was quite messy and not really in a position to be re-used and so I spent a little time just pulling that code apart, refactoring some of the functionality behind interfaces and reducing the implicit dependencies in order to try and move the code towards being a little bit more re-usable (even if the functionality it currently implements isn’t of much actual use to a real user – I’m just experimenting). 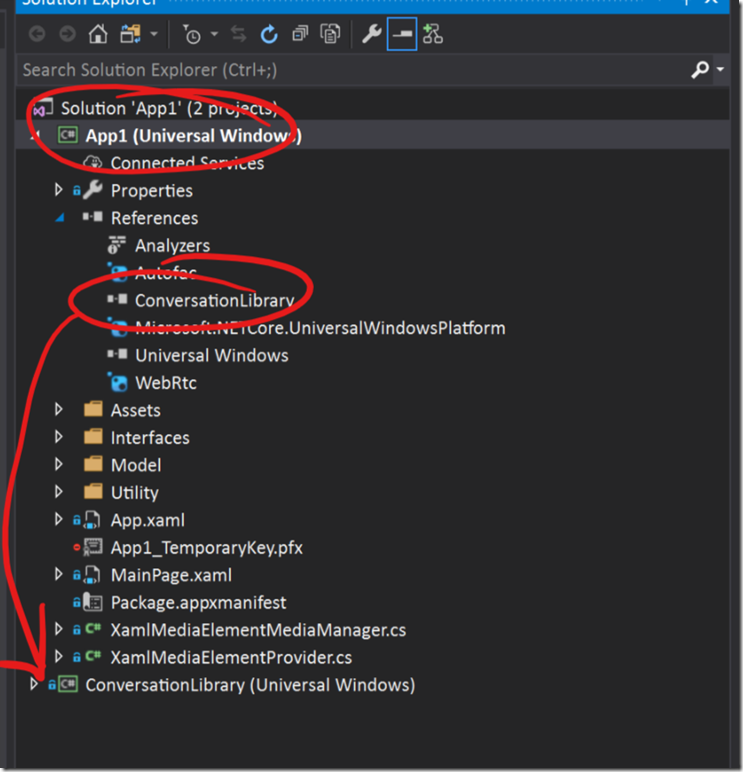 What I was trying to move towards was some code that I knew sort of worked in this XAML based UWP app that I could then lift out of the app and re-use in a non-XAML based UWP app (i.e. 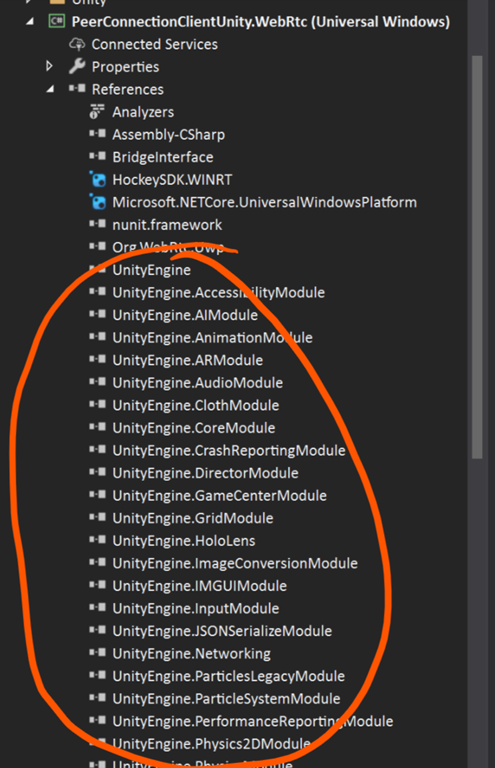 a Unity app) so that I would have some control over the knowns and unknowns in trying out that process. 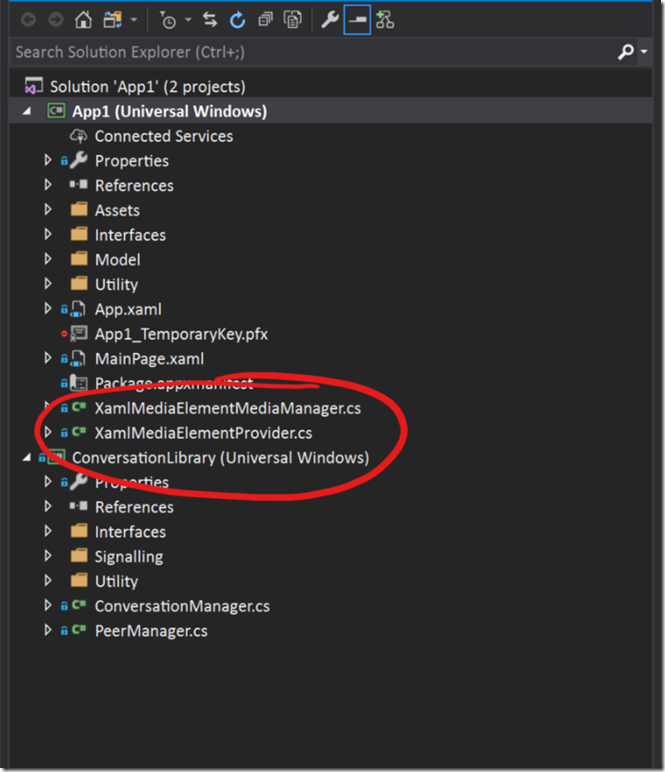 What I needed to do then was make sure that in refactoring things, I ended up with code that was clearly abstracted from its dependencies on anything in the XAML layer. with a view to making the dependencies between these interfaces explicit and the implementation pluggable. This included putting the code which provides signalling by invoking the signalling service supplied with the original sample behind an interface. 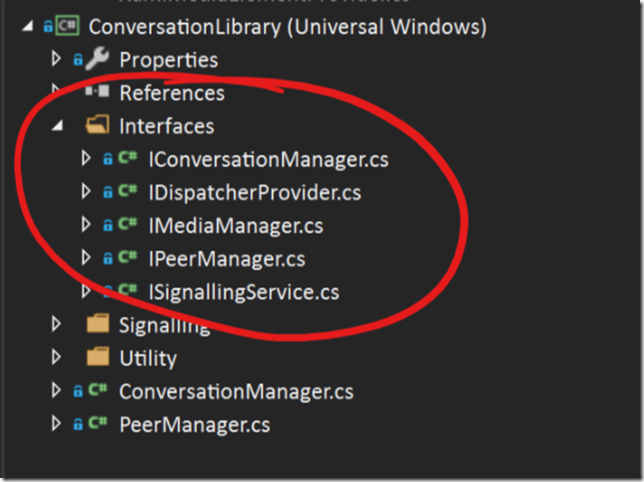 Note that I’m not at all trying to come up with a generic interface that could generally represent the notion of signalling in webRTC but, instead, I’m just trying to put an interface on to the existing signalling code that I took (almost) entirely from the PeerCC sample project in the UWP webRTC bits. 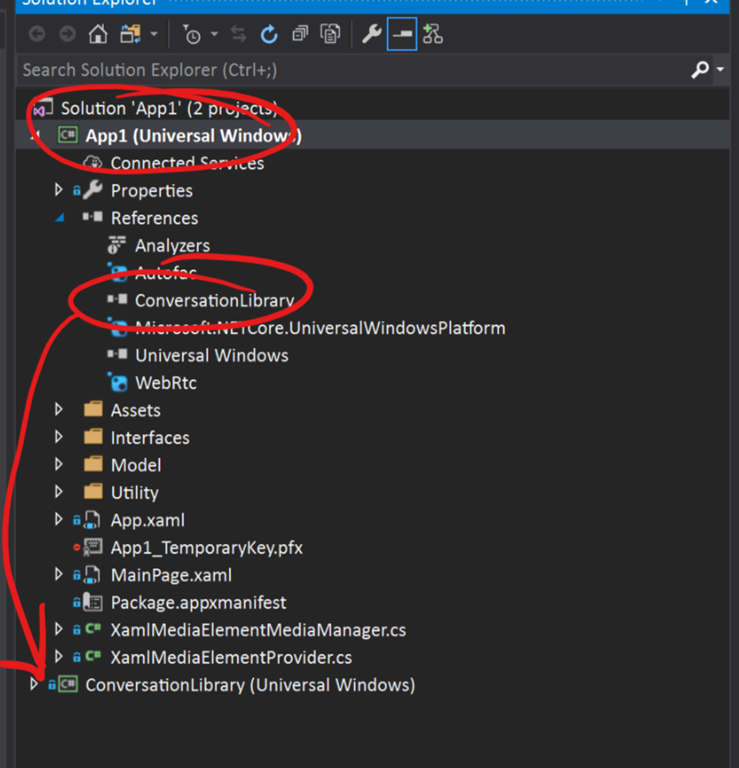 The other interfaces/services that I added here are hopefully named ‘reasonably well’ in terms of the functionality that they represent with perhaps the one that’s not quite so obvious obvious being the IConversationManager. In terms of initiating conversations – the code is ‘aggressive’ in that it simply finds the first peer that it sees provided by the signalling service and attempts to being a conversation with it. Call InitialiseAsync providing the name that the local peer wants to be represented by. 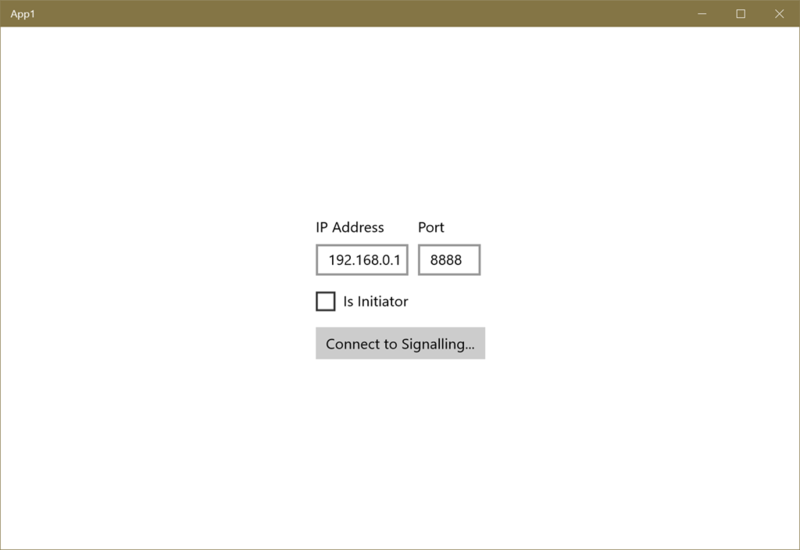 Call ConnectToSignallingAsync with the IP Address and port where the signalling service is to be found. From there, the implementation jumps in and tries to bring together all the right pieces to get a conversation flowing. 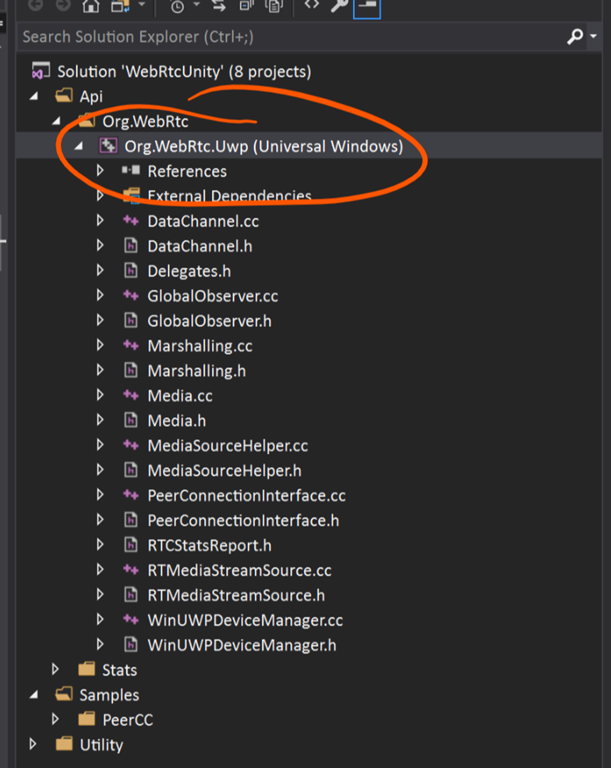 The UWP webRTC pieces need initialising with a Dispatcher object and so I abstracted that out into an interface so that an implementation can be injected into the underlying layer. 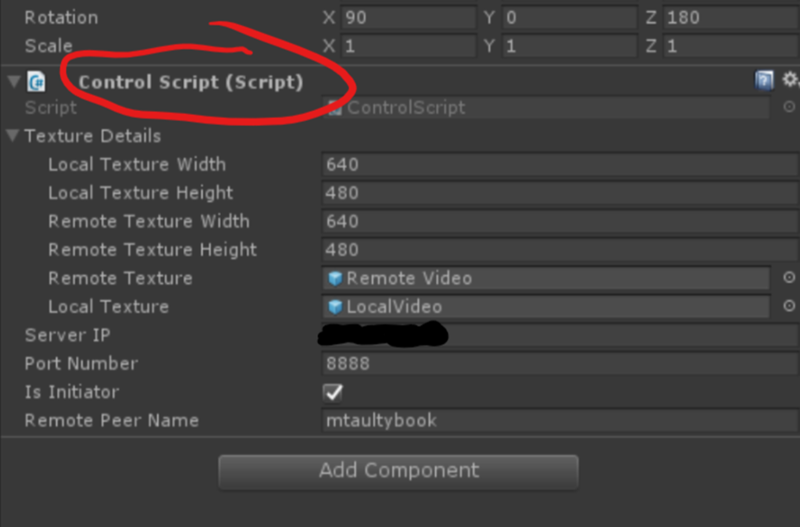 There is a need at some point to do some work with UI objects to represent media streams. 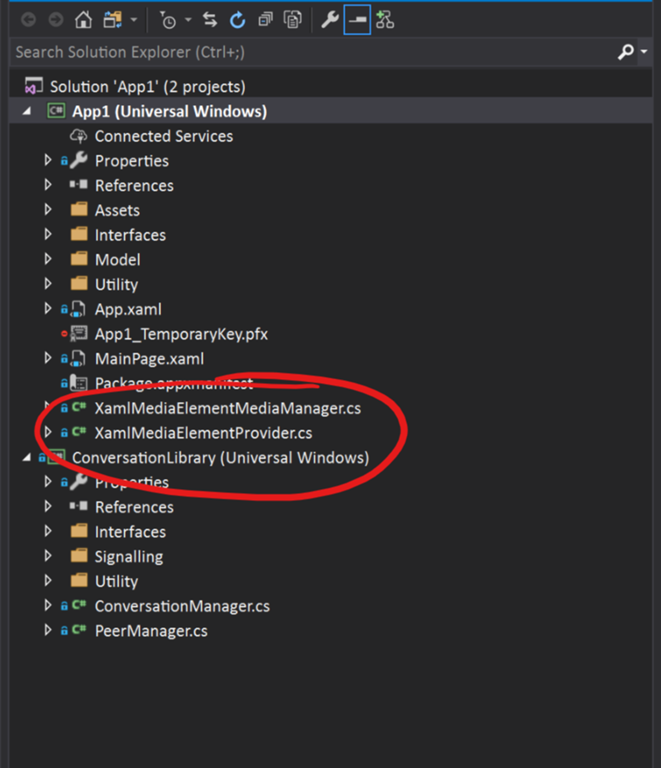 In the code to date, this has meant working with XAML MediaElements but in other scenarios (e.g. 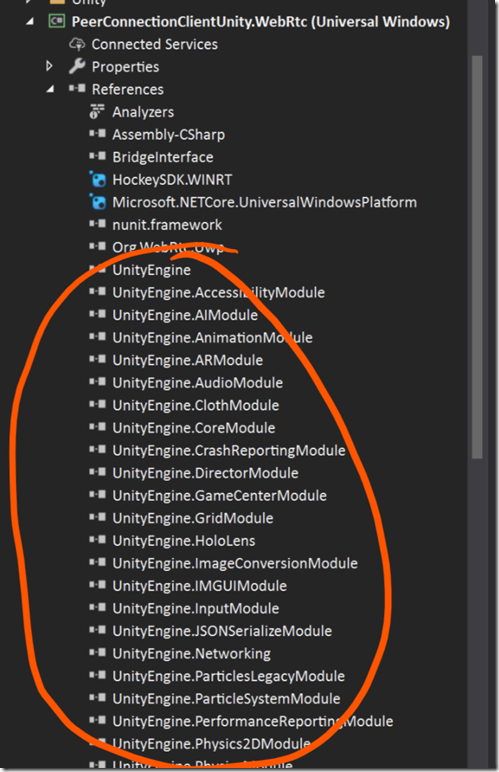 Unity UI) that wouldn’t work. My main project took a dependency on autofac to provide a container from which to serve up the implementations of my interfaces and I did a cheap trick of providing my own “container” embedded into the library and named CheapContainer in case the library was going to be used in a situation where autofac or some other IoC container wasn’t immediately available. and so that seems a lot simpler, neater and more re-usable than what I’d had at the end of the previous blog post. In subsequent posts, I’m going to see if I can now re-use this library inside of other environments (e.g. 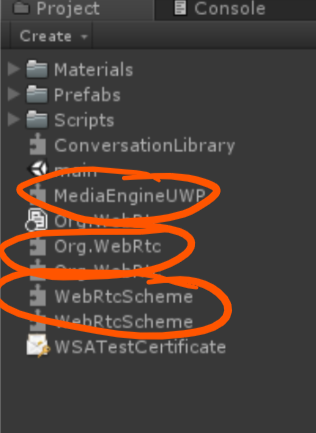 Unity) so as to bring this same (very limited) webRTC functionality that I’ve been playing with to that environment. 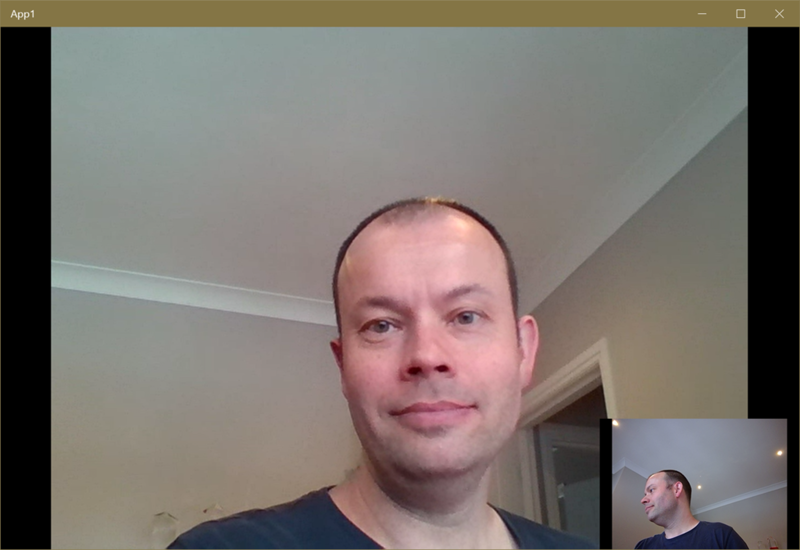 Following up on my previous post and very definitely staying in the realm of ‘rough notes’ I wanted to add a little more to the basic sample that I’d cooked up around UWP/webRTC. In the previous sample, I’d gone to great lengths to make a UI that was almost impossible to use because I was putting the burden of signalling onto the user of the UI and so the user had to copy around long strings containing details of session descriptions and ICE servers and so on. The user was the ‘signalling server’ and it was a bit tedious to pretend to be a server but it did work. 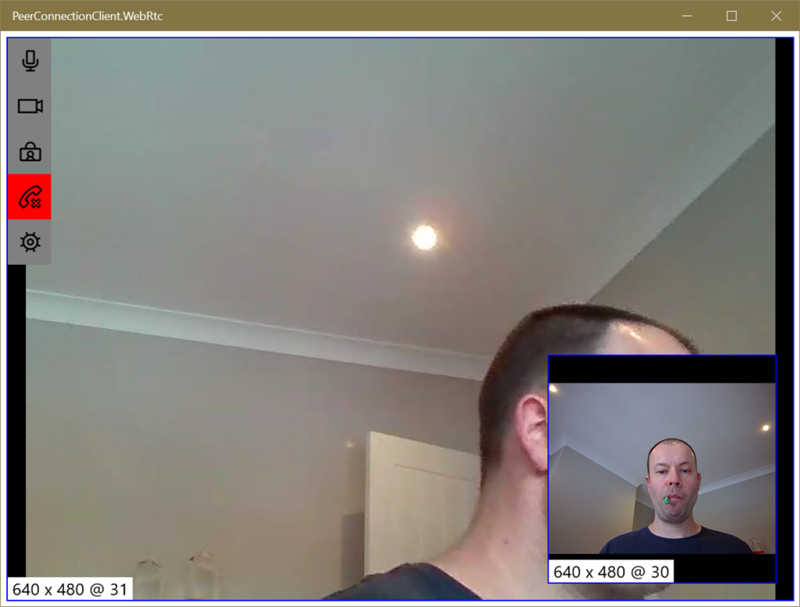 This was useful to me as it let me try to understand what was going on, what a signalling server had to do for webRTC to work and also to reduce some of the code in the sample. 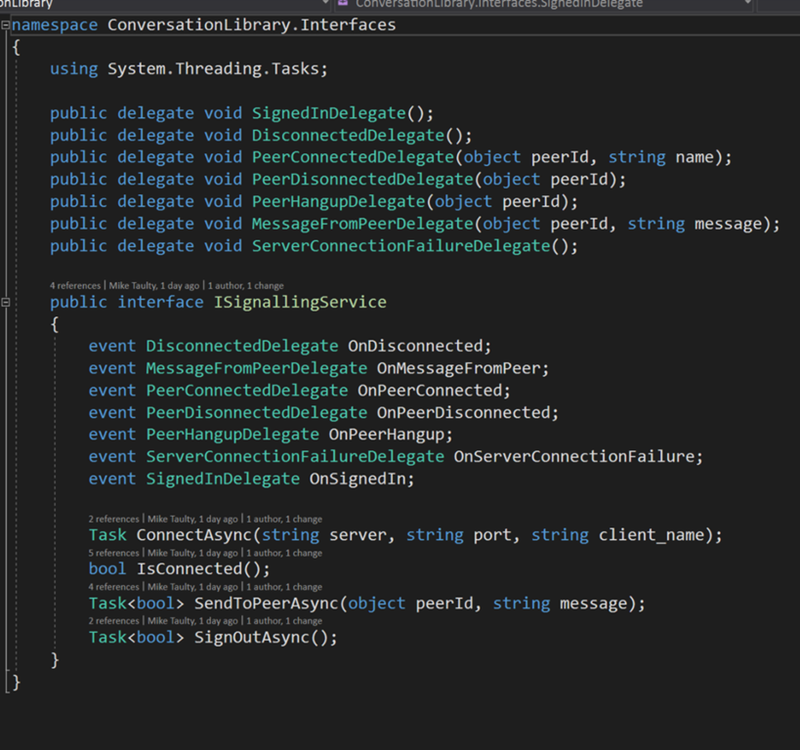 Ultimately, though if I’m going to make progress, I need a signalling server and I decided to simply re-use the console server which sits in this project within the UWP/webRTC PeerCC sample. 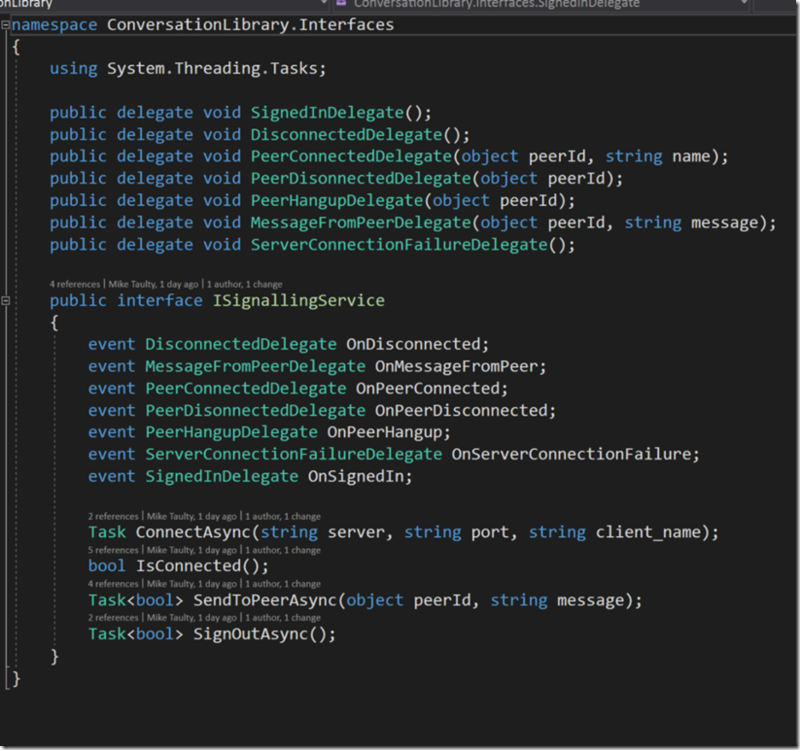 I mostly didn’t take code from the Conductor class, only the Signalling class which I moved lock stock and barrel into my project after creating a new branch (Signalling) and removing most of the existing ‘UI’ that I had as it was largely related to manually copying around SDP strings and so on. 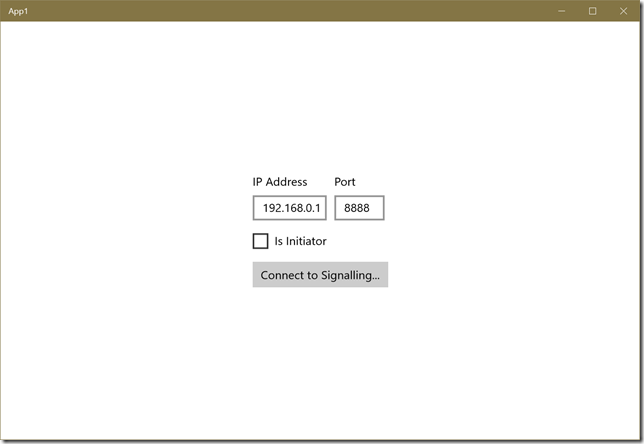 I hosted the console signalling server on a VM in Azure. Click the ‘Connect to Signalling…’ button. 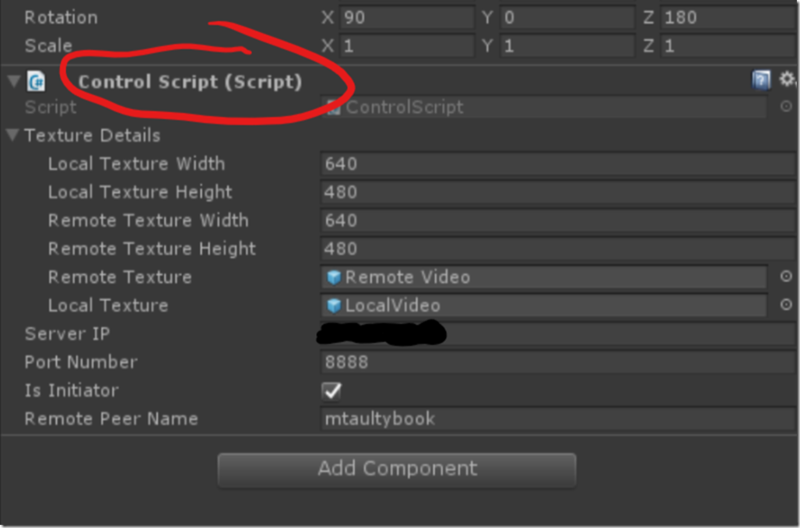 The app will then connect to the signalling service and, if successful, it replaces the UI with 2 MediaElements, one for local video and one for remote. 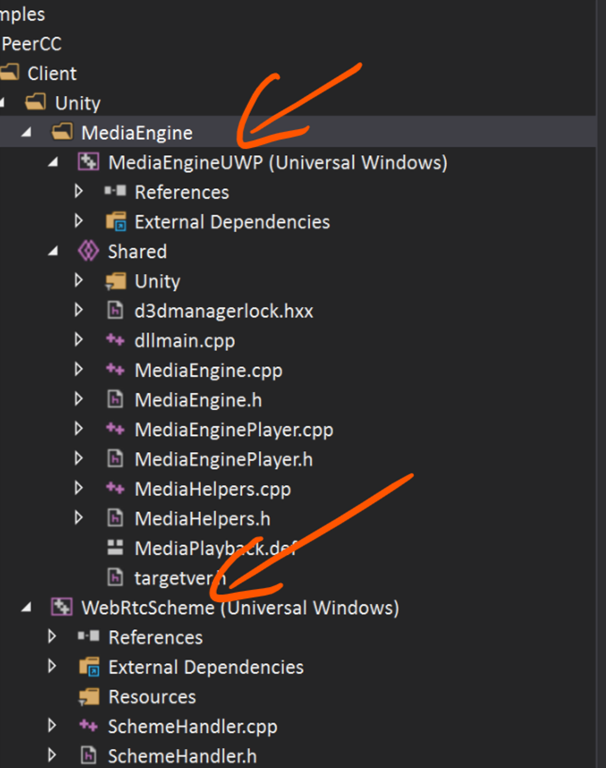 The app then goes through the process of creating a Media object and using GetUserMedia() and associating the first local video track that it gets with a MediaElement in the UI so that the user can see their local video. 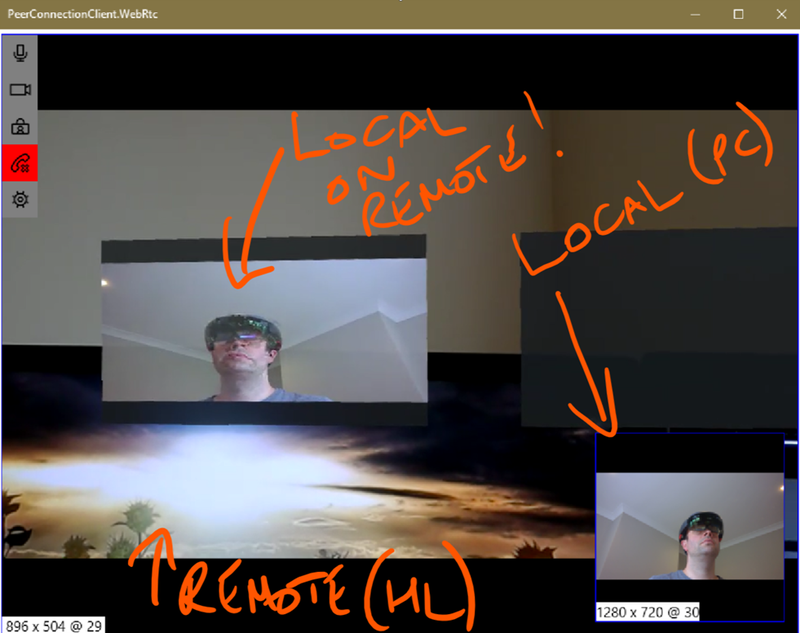 In this case, the app creates the RTCPeerConnection, accepts the offer, creates its answer, sends it back via the signalling service and adds the first remote video track that comes in to a MediaElement on the UI so that the user can see the remote video. 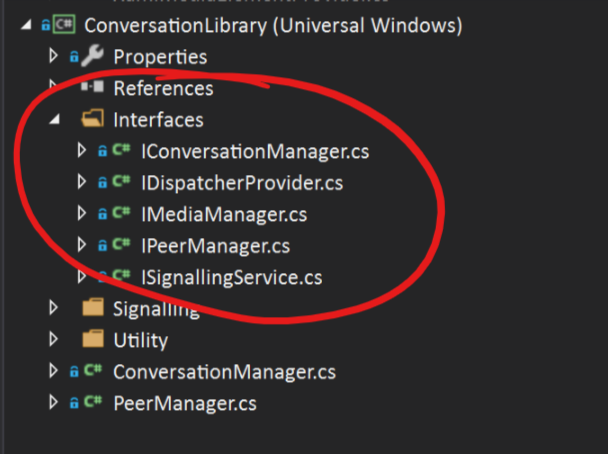 If the ‘Is Initiator’ CheckBox is checked the app will then go and create the RTCPeerConnection, create an offer and send it over over the signalling service to the remote peer. This is assumed to be the response to the offer made above and so it is accepted. And so the app is very simplistic in its approach and based on the ‘Is Initiator’ CheckBox will aggressively try and begin a session with the first peer that it sees connected to the signalling service which might not be a very realistic thing to do but it works for a basic sample. With that in play, I can run two instances of this app on two machines, tell one to be the ‘Initiator’ and tell the other one not to be ‘Initiator’ and I get video and audio streams flowing between them. Now, it’s not exactly ‘an achievement’ to put someone else’s signalling server and their protocol code back into my sample here because my first sample was mostly about how to make webRTC work without that signalling server but, again, it’s a learning experience to take things apart and put them back together again. I’d like to now refactor some code within that application as I’ve just let the code-behind file ‘mushroom’ a little and I think it I could make it better so I’ll perhaps revisit that ‘Signalling’ branch and improve things in the coming days.